Competition in the wine industry is really tough. That is why marketing professionals need to think of creative ways to promote their wine brands. One wine store literally has an oversize idea for their wine bottle display. 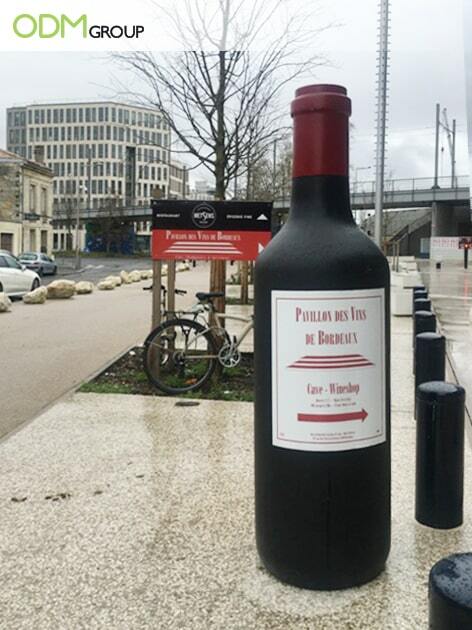 For their recent campaign, Pavillon des Vins de Bordeaux created a huge wine bottle display for their store in France. Seeing this promotional item makes me want to pop open a bottle of Cabernet Sauvignon. It’s bigger-than-life and it grabs everyone’s attention. These incredible inflatable advertising displays are also perfect for outdoor events. They’re easy to set up and provide a large space for branding. A lot of brands love this effective marketing tool. It’s mostly popular amongst beverage products. But, the use of inflatables is not limited to beverage items. This is also perfect for other products. Check out the link below to see more samples. Why do we love this Wine Bottle Display Idea? Noticeable – It’s not every day that we see colourful inflatables. So, once we see one, our attention is easily directed to it. And, a large size inflatable beer bottle is easy to spot from a distance. It easily lures the crowd to pose and take photos of it. Hence, it increases brand exposure that eventually leads to sales and profitability. Customisable – Inflatables are fully customisable. It can be customised to any size, material, shape or colour. Just ensure that the design captures the attention of the crowd. Beautiful – It’s hard to miss this marketing prop. It’s fun – looking factor makes it very conspicuous. And since it’s highly customisable, people will love the various shapes, colours, and sizes of it. This will definitely increase brand awareness. In most cases, inflatables are usually seen on tradeshows, fairs, events, and concerts. These items are perfect for the said events since crowds of people will surely see your brand. This type of promotional strategy is very powerful when done right. Unique promotional products will give you a great marketing advantage over other brands. Even if you have heaps of competition, always remember that a good marketing strategy will always raise your brand to new heights. So don’t be afraid to experiment to find the best custom promotional merchandise that will suit your branding needs. Interested in creating your very own giant inflatable? Contact us now to see if we can help you with any upcoming projects. Here at ODM we have a lot of experience in delivering high-quality design work to our clients. So, we are pretty confident that we can help you with your marketing needs. Mad Cow’s interesting take on an “outdoor” POS Display. These new promotional drinking cups with snack trays are the ultimate marketing merchandise! Perfect for your wine and game Wednesdays. You might also be interested in Giant LED screens. Speaking about oversize, we love these massive games like Jenga which will really rally a crowd at an event. Creates so much excitement.